We live today in a time of unprecedented crisis on a global scale. This is a point of agreement shared by most scientists examining planetary trends. It is also a point many nonscientists sense intuitively. They show their fear in subtle but revealing ways: rising support for religious fundamentalism, ethnic separatism, millenarianism, and a generalized "hunkering down" into enclaves within which they feel "safe" against a dark and uncertain future. This popular sentiment is a murky reaction to real threats only occasionally referenced by the sanctioned me­dia—erratic and violent weather; generation-long and global rises in the rates of cancer, inequality, and poverty; urban unemployment; shrinking government ser­vices. These are global and long-term trends from which no one is immune. Yet they are subject to local variations and reversals (such as the current drop in U.S. crime and unemployment rates), allowing for the transient illusion that one or another nation, region, class, or ethnicity may be safe. But these illusions only fuel motivation for the very separatism that can block effective global solutions. The reality felt only dimly on a popular level is well known to the scientific community. 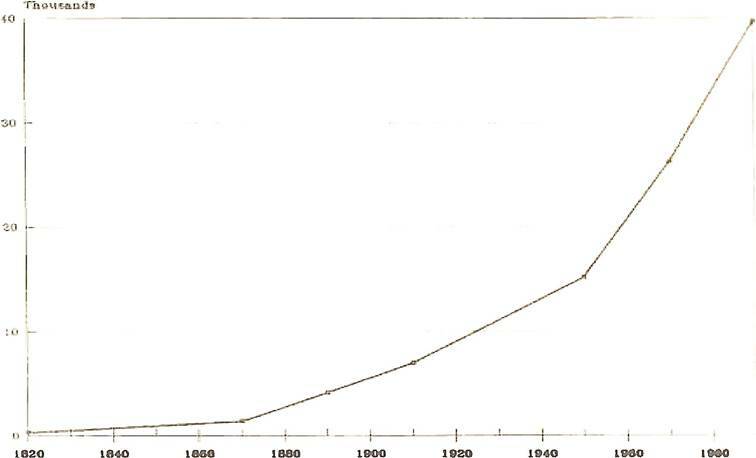 Rates of economic growth fell worldwide between the 1970s and the early 1990s, while the biosphere continues to be shredded ever more efficiently by such growth as remains (Stevens 1997, June 17, C-8). Global warming, deforesta­tion, collapsing fisheries, and ozone depletion are collectively combining to touch everyday life, while new versions of old diseases are reviving ancient plagues. At the same time, the contraction of high-wage jobs has cut into the tax base of gov­ernments across the core, encouraging them to cut social spending at the very time that it is needed the most. The crisis is real, urgent, and global. Popular fear is warranted But without correct information, that fear lends itself to manipulation by demagogues preaching isolation and separation for political gain, thereby erecting barriers of fear to the very cooperation that is so necessary for common survival. Presented here is an effort to provide needed scientific information about our crisis in a clear, systematic, and accessible way, reaching for a unified analysis that links the elimination of nature with the economic deprivation of everyday life, while showing at the same time why the urge toward political separatism is both so tempting yet so collectively fatal. Since the crises of the biosphere, economy, and political legitimacy are mutually interactive, the unraveling of their causal links is similar to teasing apart a knot in thread—all of the parts are connected, so the place to begin is almost arbitrary. Here we start at the ground and move up, both conceptually and ecologically. All life processes are driven by energy, and for the vast majority of organ­isms the source of that energy is solar, captured first by the plants and then se­quentially consumed by herbivores and carnivores. Under typical conditions plants capture about 2 percent of the incoming sunlight, while herbivores and carnivores can at best access 10 percent of the energy stored in the bodies of plants and graz­ing animals, respectively (Bonner 1988; Colinvaux 1978). In these terms of en­ergy flow, the various means by which human societies have been organized (e.g., hunter-gatherer bands, horticultural chiefdoms, agricultural empires, and the cur­rent structures of global capitalism) can be understood as ever more aggressive efforts to channel solar energy away from competing species and toward exclu­sively human consumption. The nested problems of our times can also be stated in these thermodynamic terms as arising from the collision of our expanding energy consumption with the limits set by primary plant production. The dependence of humans upon plant production has ultimately forced our species to relinquish its original freedom as roaming gatherers, scavengers, and occasional hunters in favor of securing a predictable future food supply as farm­ers, thereby cutting out the "middlemen" of herbivore insects and animals. The passage of the millennia since those initial settlements has allowed plenty of time for the development of agricultural techniques that maximized yield per acre, tech­nologies specifically adapted to local conditions of soil and climate. One of our current problems lies with the misapplication of techniques developed for the tem­perate regions to the tropics. But to understand why this is, we must first digress into the question of soil types. The climactic stability of the period since the end of the last ice age has allowed for the stable reproduction of locally adapted plants, which give the ap­pearance of being, in the words of one ecologist, "Nation-States of Trees" (Colinvaux 1978, chap. 5). Huge areas of continents worldwide are dominated by a narrow range of similar tree, bush, and grass varieties. Below the arctic tundra are hundreds of miles of conifers and other evergreens, merging as one moves south almost imperceptibly into deciduous hardwoods, themselves gradually giving way to either desert cacti or tropical broad-leafed softwoods, depending on the abundance of rain. Finally, of course, there is the broad band of tropical rain forest around the equator, the object of so much recent world attention. Ecological investigation has demonstrated that these broad areas of plant similarity are the products of evolutionary selection responding to the climactic stability experienced within each of these different biomes: a stability of tem­perature, wind, and precipitation acting over the nine millennia since the end of the last glaciation (Colinvaux 1978, chap. 5). The key insight that explains these various plant forms is their efforts to maintain the conditions of temperature, sun­light, and nutrient flow that will optimize photosynthesis within the limits im­posed by their local climates. Below the arctic tree line the dominant vegetation is evergreens. The needle shape of their "leaves" minimizes the heat loss of evapora­tive cooling while still allowing for a high density of chloroplasts (the site of photosynthesis), which gives them their dark green color. Further, this shape's thermal efficiency allows the needles to be productive of sugar energy even during very cold and/or cloudy periods. South of the broad belt of conifers lies a contiguous belt of mixed conifers and deciduous trees. During the summers of this northern temperate zone, the broad-leafed deciduous trees are at a distinct advantage, gathering solar energy much faster than their conifer cousins. But during the winter, the conditions are exactly as in the arctic. Here the needle strategy excels over the broad-leafed, allowing the conifers to prosper while the broad-leafed plants have given up altogether, shed­ding their leaf factories and escaping into hibernation. When the line of arctic weather retreats northward in the spring, the deciduous broad-leafed strategy once again triumphs, and the broad leaves are generated anew. Further south, below the southernmost reach of the arctic winter, the high rate of evaporative cooling char­acteristic of the broad-leafed deciduous trees becomes an adaptive advantage be­cause the summers are warm and humid. Under these conditions the conifer strat­egy no longer pays off, because needles become too hot in the summer and do not compensate adequately during the short and mild winters. In the deserts, plant life takes on shapes that minimize the surface area ex­posed to the sun while maximizing the surface area exposed to wind—the exact opposite of the conifers of the North. Also, they have evolved means of carefully guarding their water against unnecessary loss. Yet they share with the tundra plants of the far North the quality of extremely slow growth, reflecting the severity of the struggle against their harsh climates, a struggle that allows only the most meager rate of biomass accumulation. At last we come to the tropics, where weather is stable year-round except when punctuated by storms. As in the desert, the sheer abundance of sunlight re­quires some mechanism of cooling. Yet here the copious supply of rain supplies that cooling, allowing for very broad-leafed plants to prosper, shedding excess heat by evapo­ration, despite the humidity. The absence of winter means both that the broad leaves can be retained permanently and that thick hard bark is unnecessary. All of the retained solar energy can thereby be released for growth, a condition that generates the profusion of biomass stereotypical of our images of tropical jungles. Most of these plant designs had evolved long before the last ice age. But it has only been since the last ice age that they assumed their current geographic positions. During the nine millennia since, they have changed the composition of the soils beneath them in fundamental ways, ways that continue to channel where and how we can grow food. In the broad belt of conifers ringing the arctic below the tundra, centuries of needle accumu­lation have led to acidic soils of limited agricultural value even in areas having a growing season. But further south, in the mixed boreal/deciduous forests and even more in the purely deciduous biomes, the fallen leaves have lower acidity. More importantly, the annual winters retard the decomposition process, allowing for the slow accre­tion of organic humus (incompletely “digested” plant matter) at the rate of about one inch per century (Colinvaux 1978, chap. 7). This organic residue is unique to the temperate zones and has gradually altered the soil chemistry so as both to infuse it with nutrients and also to make it chemically more receptive to bonding with them. It is this same combination of soil ingredients unique to the temperate zone that allows for the irresponsible farmer to reuse the same plot of land almost indefinitely. Further south still (skipping over the deserts) in the tropics, the majority of the soil is sterile. This appears bizarre when one considers the plush and abundant growth of a rain forest. The answer lies in the vigorous and competitive growth of life enabled by the constant moist warmth there. The surface life on top of the soil (fungi, bacteria, insects, and their predators) so quickly and efficiently devours fallen dead wood and animals that their nutrients never get the chance to get fully ab­sorbed by the ground. Any molecular morsel remaining after this thorough treat­ment by decomposers is eagerly snatched by the network of near-surface roots supplying the forest trees. The evolutionary efficiency of this matrix of life in the rain forest (ultimately powered by the constant stream of intense solar energy) prevents the percolation of nutrients down into the soil, thereby disabling the chemi­cal processes that sustain the gray-brown soils of the temperate zones. Instead, tropic and near-tropic soils are red, having long ago been washed clean by millen­nia of rain of the clay silicates that capture and reproduce the gray-brown humus of the temperate biomes. Abundant evidence suggests that hunter-gatherer bands were well aware of the technology of horticulture long before they chose to use it, presumably be­cause they knew also that it would require much more time and energy than they were willing to invest. But, eventually, growing population density in the tem­perate regions required the shift to plant cultivation in order to reduce between-group competition and warfare. The same process also operated in both the tropics and the polar regions, but the much poorer land productivity there pre­cluded the solution adopted in the temperate realms of increasing land productiv­ity: instead competing groups were compelled to separate from each other across much greater spaces in order to survive or else be condemned to constant warfare (Chase-Dunn and Hall 1997). For the peoples of the northern Polar Regions living atop or just south of the vast ice sheets capping the arctic, exploitation of plant energy was never a serious op­tion. Instead, they were compelled by the constraints of their climate to live as carnivores, searching out prey (marine and terrestrial) whose migrations north served as imports of solar energy from the south. Hence the development of complex societies based upon dense human settlements was vitiated from the start. Similar constraints operated in the tropics. This may at first seem strange. After all, it is the tropics that have always had the strongest and most consistent input of solar energy leading to the greatest biodiversity and may well have been the initial environment of the first humans. Yet most of the areas of initial Neolithic settlement are well north of the tropics. Once again, the answer lies in the soil. Among indigenous peoples still living in the tropics, rotating slash-and-burn (swidden) horticulture continues to be the technology of choice. This is because the ashes left from burning temporarily boosts the fertility of the soil, allowing for the growth of edible plants until the soil is again washed clean by the rains. Once harvested, the cultivated area is deliberately allowed to revert to forest. Over eons this strategy has worked, because the small size of the plots of land involved is well within the scale that can be eventually repopulated by the limited coloniza­tion strategies available to vegetation in the tropics. However, the ecological con­straints placed on the reproduction and spread of tropical plants places a strict upper limit on the density of human population that can be supported by swidden technology. This ecological barrier—as rigorous as that operating in the Polar re­gions—here again prevented the emergence of the densities of human settlement required for complex social systems, forever stalling the development of societies more complex than chiefdoms in the tropics. These preconditions of long-term soil fertility are found only in the soils beneath the temperate forests. Hence the Neolithic breakthrough to collectively managed horticulture on a large scale was both compelled by the population den­sity accumulating in favorable climates, while yet also being enabled by the com­bination of solar energy and soil fertility peculiar to those climates. This technical and organizational revolution was also the first historical demonstration of an abil­ity perhaps unique to humanity—the capacity to collectively plan and execute a strategy to deliberately and systematically divert solar energy away from compet­ing life-forms toward exclusively human use. The soils laid down and evolving under the deciduous broad-leafed regions north of the tropics were of the gray sort most fertile for cultivation, which had been gradually stocking up precious topsoil at the rate of one inch per century. These were the soils that became the ecological foundation for the complex "tribu­tary” empires of our past—the Mesopotamian civilizations; the Harrapan, Mauryan, and Gupta civilizations of India; the Han dynasty of China; the Greco-Roman empires. But although more tolerant of human agricultural exploitation than other soil types, they can still be exhausted by sufficient misuse. The current arid sterility of the Middle East and much of the peninsulas of the Mediterranean bears quiet testimony to the depredations of past abuse: massive deforestation (al­lowing erosion of topsoil) along with grossly excessive irrigation (salting the soil to toxic levels). Recent research suggests that the collapse of more than one em­pire may have been rooted in soil depletion (Runnels 1995; Chew 1996). But de­spite these excesses, the greater fertility of the bulk of the temperate regions even­tually came to support the highest population densities on the planet throughout the nine millennia since the Neolithic revolution. Capitalist social production relations in the agricultural sector did not of itself alter the centuries-old techniques of the tributary mode. Europe had, by the eighteenth century, long been familiar with the medieval use of the three-field rotation system that restored soil fertility by the growth of nitrogen-fixing plants (often legumes or clover) as one of the three crops; Southeast Asia had likewise settled the technical aspects of optimum production for the fertilization of rice paddies; while the Andean peoples of the Incan civilization had devised ingenious methods of prolonging the growing season for potatoes by plant­ing them in raised rows adjacent to troughs of water. Each of these approaches to maximizing land productivity had evolved over centuries of experimentation in their respective regional biomes, and the development (or imposition via conquest) of capitalism did not change these approaches. However, the adaptation of steam power to the development of the first trac­tors near the turn of the twentieth century was one of the very first applications of the current era of technological revolution to a rural environment. While designed originally as a replacement for the horse, the early tractors were too expensive for purchase by the typical family farmer. So instead entrepreneurs would invest in them cooperatively while also hiring men to operate and maintain them and send these teams of men and machines from farm to farm for hire (the same business model of locally pooled capital investment used by farmers building Yankee Clipper ships in Maine.) The beginning of this new technology was in the United States, both because that was where the first manu­facturers of this equipment were located and because farmers in the U.S. were relatively wealthy as compared to their counterparts elsewhere on the planet. As the market for farm machinery expanded, economies of scale, Taylorism. and assembly-line organization allowed the price of farm machinery to drop. Immediately affected was the use of animals as motive power: between 1865 and 1915 the number of horses and mules for every hectare of cropland fluctuated around 0.3, with a high of 0.35 in the first year and a low of 0.25 in 1880. (These numbers and the ones following are all derived from figures provided by Mitchell [1993) and the U.S. Bureau of the Census.) 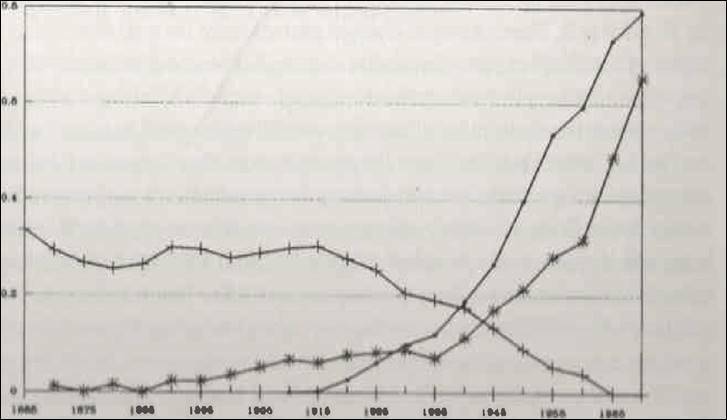 But after 1915 (five years after the appearance of the tractor in the records) the number began to drop consistently, passing below 0.2 in 1930, 0.1 in 1950, and disappearing entirely from the books in 1965 (see Figure 2.1). To this trend out for animals we see the inverse for tractors. 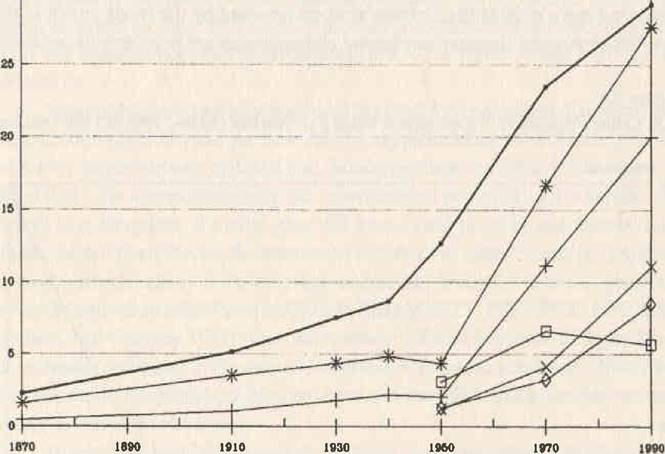 Starting with their appearance in the census records in 1910, the number of tractors per hectare planted in food crops doubled every five years until 1935, after which it shot up dramatically from 0.01 in 1935 to 0.08 in 1970. These numbers provide a very clear demonstration of the displacement of solar (organic) energy by fossil fuel (machine) power. In addition, when we remember to include fertilizers as themselves drawn from fossil fuels, their application to cropland has closely fol­lowed the use of tractors, again shooting up fastest after 1935 (Figure 2.1). The development of machines also began to displace human labor as well. In 1830, agricultural workers comprised 70 percent of the workforce and in 1870 50 per­cent, but as early as 1913 the percentage was cut almost in half (27.5 percent), while by 1950 it had shrunk to 13 percent, and in 1991 was only 1.6 percent (Maddison 1995, table 2-5, 39; World Bank 1995b, table a-2. 148). Meanwhile, the share of U.S. agricultural production as a percentage of its GDP stayed largely the same between 1950 and 1990 (World Bank 1982, 1995b). The substitution of mechanical energy powered by fossil fuels for the tra­ditional organic labor of animals and people in all areas of production has been the most important trend of our era. But in agriculture as in all other spheres, the transition has entailed important costs. Here this cost is most obvious in the loss of topsoil that came with the new machinery. To understand why agricultural machinery has accelerated topsoil deple­tion we must first spell out some of the side effects of machinery itself. The most efficient application of machines is to single-crop fields that are large. Oth­erwise the farmer sacrifices the economies of scale enabled by machinery to time spent changing the types of equipment. Animal-drawn ploughs can steer around large rocks and trees, so low-capital family farms relying on solar energy could function profitably along the east coast up into the Appala­chian Mountains during the last century. But heavy equipment works best when unobstructed by rocks, trees, or bushes, which has favored both the previous westward mi­gration of farming within the U.S. out of the mountains and into the plains states and also to deforestation and major loss of species diversity in those states. Meanwhile, ironically, this same movement west has allowed for a reforestation of the U.S. east coast and eastern Midwest as family farms have gone bankrupt (particularly Black-owned farms during the Depression), along with the return of birds, deer, coyotes, and bears to these regions (Stevens 1997, June 10, C-1; Rudel and Chun 1996). Loss of trees and non-crop plants in active farming areas eliminates windbreaks and greatly accelerates erosion and topsoil runoff, while the machinery itself cuts deeper into the ground than animal-drawn ploughs used to. (That's one reason why the Mississippi is also called the "Big Muddy," as flooding and erosion flush out the best soil and the chemicals applied to it from the Midwest plains.) Another spin-off problem is that the water runoff takes not just topsoil but also the other chemicals applied to fields. Just as DDT killed birds, so a growth regulator found in vitamin A and used as a pesticide is cur­rently thought to be a leading suspect behind a massive problem of gross frog mutation recently identified in Wisconsin (All Things Considered, National Pub­lic Radio, May 9, 1997)) Nicanoid pesticides contribute to bee colony collapse, yet bees are essential for crop pollination. But the most important toxic run-off is nitrogen. When rivers carrying nitrogen fertilizers empty into lakes and seas, the nitrogen acts as it was designed to: accelerate plant growth. In lakes and seas the plant beneficiaries are algae, producing temporarily huge “blooms” which die of “old age” after a few weeks, falling to the bottom. Their corpses are digested by organisms that consume oxygen, suffocating fish and generating environments that only anaerobic organisms can thrive in, organisms toxic to most life forms. The net result has been the growth of “dead zones” in the Caribbean and great lakes. The mechanization of monocrop agriculture, when combined with the appli­cation of some kinds of petrochemicals to enhance soil fertility, other kinds to dampen competition from weeds, and still others to decrease predation by insects or disease, succeeded spectacularly in its original goals. 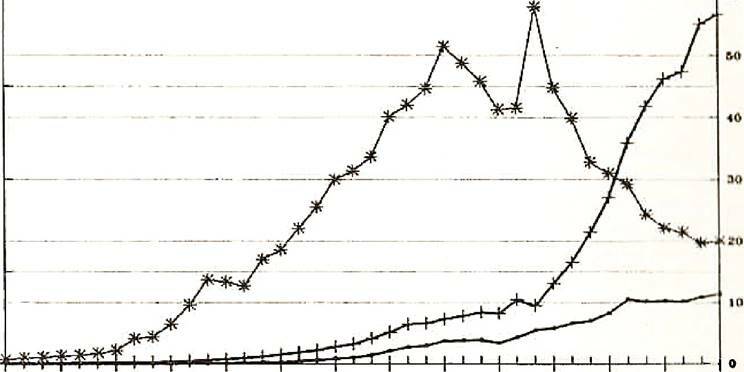 Yield per acre and per worker both went up steadily throughout the twentieth century, and especially af­ter World War II. These technical changes also achieved the goal of lowering con­sumer prices. But there have been other, less well-advertised, effects as well. The use of these techniques has become increasingly expensive, raising the barriers to entry even as they have reduced the price—and thus the profit per acre—of farm­ing. An important result has been the consolidation of an increasingly corporate ownership along with the gradual washing out (accelerated during recessions) of family farms. From a low point of an average of 140 acres per farm in 1880, the mean size stayed roughly the same at below 150 until 1935. 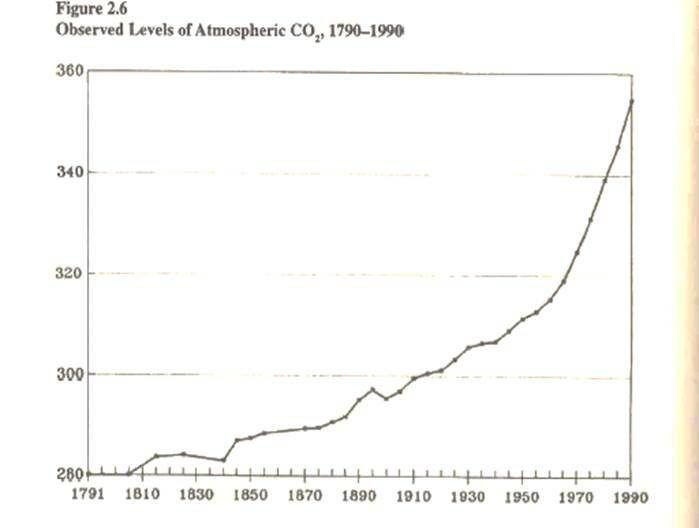 Then, mimicking the other indicators, it starts a sharp slope upwards of 25 to 50 acres every five years, reaching 461 in 1990 without showing any sign of stopping (Figure 2.2). Hence yield per acre rose consistently starting in the depression years, but did so at the cost of a total commitment to fossil fuels, artificial fertilizers, and the corporatiza­tion, automation, and centralization of ownership and production. 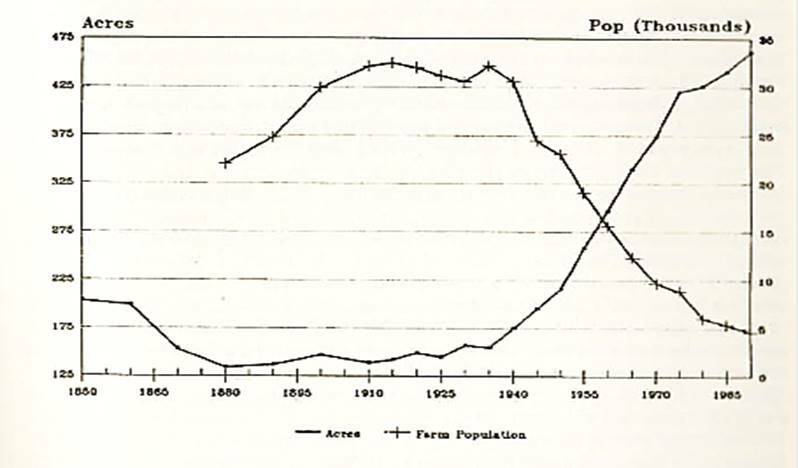 The absolute number of people on farms peaked also in 1935 at around 31 million, after which it declined in an inverse echo of the other trends to a mere 10 million in 1970 (Figure 2.2). The same is true at an even higher level among the main beef suppli­ers: McMichael (1996. 102) reports that only three corporations headquartered in the United States (Cargill, ConAgra, and Tyson's Foods), in cooperation the Japa­nese firms C. Itoh and Nippon Meat Packers, supply a controlling share of global feedlot supplies and meat products. Global Model: The "Green Revolution"
The detailed focus on the agricultural pattern inside the United States is not intended to be parochial. To the contrary, l have lingered on this example precisely because it was to become an international global model encouraged by U.S policymakers for emulation throughout the world (McMichael 1996). As early as the Marshall Plan, the U.S. approach to agricultural production was being promoted by Washington to selected European farmers (All Things Considered, Na­tional Public Radio, June 5, 1997). During the following decades, the U.S. method of high fossil-fuel inputs was also extended to the periphery as the most efficient solution to the demands of the global agricultural market (McMichael 1996). The centerpiece of this campaign was the "Green Revolution" (a presumed prophylactic for the spread of the dreaded "Red" revolutions then breaking out across the periphery). It was an effort to use a technical "fix" (increased food production) to a social problem (class polarization and generalized malnutrition). The Green Revolution sought to increase the yields of rice and other staple crops for use in the periphery, along with building their resistance to predation by insects, fungi, and bacteria. In many ways it succeeded (and continues to evolve). However, optimal use of these altered varieties led to several unanticipated conse­quences. For many of the crops "improved" by breeding (particularly during the ini­tial periods of the 1960s and early 1970s), more water and fertilizer were needed than that traditionally applied to optimize performance (faster growth requires more inputs.) In the case of water, costly irri­gation pumps were needed often enough that the introduction of these new crops requiring these pumps had the effect of raising the economic barriers to entry for peasant farmers, along with the minimum land area necessary to profit, thereby expelling poorer peasants to the cities (just as U.S. "family" farms have themselves been expelled) (Perlman 1977; Burbach and Flynn 1980). Alternatively, peasants pushed out of traditional land have colonized the poorer soils along the mountainsides by cutting down rain forests. Increased irrigation also accelerated the rate of topsoil loss and salinization, resulting in a long-term postwar global decline of productive land area (Pimentel and Harvey 1995). The requisite fertilizers themselves had to be bought from the U.S. or other core countries (increasing the need for foreign exchange [U.S. dollars], and thereby also the pressure to grow cash crops for export for dollars instead of food for local use), compounding rural class polarization. For peasants without enough money to buy new equipment, the solution nearest to hand has been to have more children to increase family labor power. This has been another unanticipated consequence of the "Green Revolu­tion": delaying the completion of the demographic transition by prolonging the period of high fertility in the countryside. By tying peasant income directly to the world market price for their cash crops, lower and uncertain sales from the use of the new crop varieties sustained high rates of fertility (to create new labor input), despite the drop in mortality brought about by new public health measures (Folbre 1977; Grimes 1982; Mamdani 1972). Now, in 2017, twenty years after this initial essay (1997), rural automation plus climate contraction of arable land have forced a drop in human fertility, although cultural time-lags continue to over-produce excess unemployed young men compelled to either migrate north and/or join armed gangs attached to smuggling and/or anti-state insurrection. The bloom of this armed underground economy is most obvious in Mexico and Central America in the Western Hemisphere; the countries in the Sahel in Africa; and the geographic swath east of the Red Sea including the war zones of Yemen, Iraq, Saudi Arabia, and all of the “Stans” up to and including Tibet, Myanmar, and south China. Further, the replacement of traditional plant species and their genetic di­versity by an imported group dependent on further imports is a questionable long­-term strategy. As the land becomes less fertile with degradation it eventually is abandoned. Its productive life thereafter can only be extended by growing cocaine, opium, or other very high-priced crops, because traditional crops do not even repay the cost of the fertilizer. The contraction of arable land combined with the overproduction of children creates unemployment and migration from the global “south” to the global “north.” This migration contributes to the political destabilization of the north discussed below. Possibly the most serious natural resource problem now affecting all nations is land degrada­tion . . . many activities in traditional as well as in modem industrial society contribute to the deterioration of soil quality and the loss of agricultural land; losses include soil erosion, loss of fertility, laterization. salinization and water-logging, desiccation, conversion to ur­ban uses, and contamination by toxic wastes , the effects of soil mismanagement are characteristically slow, incremental, and cumulative, so that internationally significant in­jury may not be evident until irreversible damage has been done. Bundled into this transition is also a dangerous dependence on fossil fuels for most inputs to compensate. But, unlike the temperate soils that dominate the United States and Europe, a large part of the soils in the periphery are tropical, hence (once large sections are cleared) they quickly become completely dependent upon ex­ternal inputs (Colinvaux 1978, chap. 7). Any prolonged disruption (or sig­nificant price increase) of imported inputs would necessarily result in a dramatic contraction of output and the transformation of the formerly tropical soil into a wasteland (it cannot revert to tropical forest because of the soil sterility of tropical soils discussed above [Colinvaux 1978]). A closely related problem emerging in recent years has been a growing short­age of fresh water (Caldwell 1996, 258; la Riviere 1990, 37-48). The aspect of the global water cycle of concern here is the rate of flow. Fresh water on land is re­newed by ocean evaporation (and desalinization) followed by rain over land, after which it eventually returns to the sea. Over geological time, fresh water has accu­mulated in glacial snow packs and underground aquifers. (A huge example of the latter is the Oglala aquifer—named after the Sioux tribe—which stretches from the Dakotas south as far as Kansas and Colorado.) The demand for fresh water for both irrigation (currently 70 percent of global demand [World Bank 1997]) and urbanization has come to exceed the flow provided by rain, most severely in drought prone areas. To compensate, deeper wells have tapped aquifers. The Oglala aqui­fer has been tapped to supply Las Vegas, Los Angeles, and farms in southern Cali­fornia to augment the flow of the Colorado River (itself so drained that during some summers it no longer makes it to the ocean). In the former Soviet Union. the Aral Sea has contracted 50 percent, and the remainder has dangerous levels of salinity and petro-toxins (BBC, Outlook May 14, 1997). Over the short term, the retreat of glacial snow packs adds to river flow in more temperate climates, but that is at best a mixed blessing. We are collec­tively consuming our water "capital,' which will ultimately require restoration of the balance via a massive contraction of use. This can only mean sharp contractions of agricultural output and urban size or use (la Riviere 1990, 37-48). In the first few millennia of human agriculture, it was not understood that continuous irrigation eventually deposited enough salt on the soil surface that fer­tility disappeared. In an analogous fashion, only now is it becoming also clear that continuous irrigation from wells liberates arsenic from its bonds to the soil, creating a gradual buildup of arsenic in the well water. Arsenic is a cumulative toxin for which there is no known cure. Recently the BBC reported that the British Geological Survey has discovered that the problem has become so widespread in Bangladesh and parts of India that an estimated 30-60 million people are being poisoned by their well water, a problem sufficiently grave that the World Bank has dispatched a team to investigate (BBC, The World Today, May 8, May 19. 1997). Current technologies used in global food production have achieved their historic highs of yield per acre only by supplementing natural energy inputs with ever-larger amounts of fossil fuel. Insofar as there are limits to the supply of fossil fuels, the enormous subsidy they provide must eventually grow smaller and finally stop altogether. By itself, that will lower yield per acre and thereby raise prices. Added to these challenges are the current uncertainties of global warming (explored at greater length below). If the warming reaches the levels now officially projected by the Intergovernmental Panel on Climate Change (IPCC 1990; IPCC 1992.; Karl, Nichols, and Gregory 1997), then the reversion of arid farmland to desert (as is now already underway in the state of Nebraska) will tend to accelerate, illustrating the removal of marginal land from production. This will become another pressure acting to increase food prices. The post-war explosion in global food production has been predi­cated on the extension to the tropics of a technology developed for application to the temperate zones. In both regions the technology requires the massive subsidy of a finite resource—fossil fuels—to boost production. While this subsidy is unsus­tainable over the long term in either region, it is particularly unsuitable to the tropics, where the baseline soil fertility is so very low that withdrawal of fossil fuels would quickly lead to complete agricultural collapse. To the degree that glo­bal food output is relying on a transient and artificial fertility of tropical soils, then to that same degree it is hostage to the availability of cheap fossil fuels. The "industrialization" of agriculture was, as the term itself implies, the trans­fer of technologies originally developed for application to urban manufacturing facilities to the growing of plants. The mo­tivation for the development of machinery to production was to better control la­bor and reduce the number of employees where possible (e.g., Braverman, 1974; Marglin in 1974; Stone 1974). As was true of agriculture later, the result was a substi­tution of fossil fuels for solar (human) energy. Again as with agriculture, the eco­nomic results were spectacular. Maddison (1995, 36) has calculated that, in the United States, the value in constant 1990 dollars of just machinery and equipment alone per worker traces a path like that found in agriculture: while in 1820 the value was 281, in 1870 it had quadrupled to 1,367; in 1992 it was 39.636 (Figure 2.3 below). The clever application of machinery to an ever-expanding range of human activities has been geometric, and today it has been given an added boost by the microprocessor. Additional data Maddison provides demonstrates that this sequence of jumps in worker productivity found in the U.S. is typical throughout the world-economy, although the values are predictably smaller in the periphery (Figure 2.4) (Maddison 1995, 249). Once again, machinery powered by fossil fuels is both faster and more reliable than human workers powered by the foods grown in the sun. Yet once again there are unpleasant consequences not popularly understood. Figure 2.3: U.S. Labor Productivity: Equipment value/worker 1820 to 1990, in 1990 dollars (Maddison, 1995). From 1930 to 1990, the global production of fossil fuels rose from 1.3 billion barrels of oil equivalent to 7.34 billion barrels; of which the United States produced 46 percent in the first year and 20 percent in the second (Figure 2.5; data from Etemad and Luciani 1991; the United Nations Energy Statistics Yearbooks). Inside the U.S.in 1987, 36 percent of its consumption was for industrial production and another 37 percent for transportation (mostly also connected with the requirements of production) (Gibbons, Blair, and Gwin 1990, 94). The upward burst of fossil fuel production after 1935 both globally and inside the U.S. parallels the history of the application of fossil fuels to agriculture and industry documented here for the U.S. alone. Among the unwelcome by-products added to the biosphere by recent industrial production technologies have been excessive heat, resource exhaustion, acid rain, environmental estrogens, chlorofluorocarhons (CFCs), which cause ozone depletion and greenhouse warming. We will take these in turn. The simplest and most elemental spin-off of any material transformation is heat. The second law of thermodynamics requires that all material transformations involve energy, and the greater either the speed of those transformations or their degree, the greater the energy involved. Energy, in turn, ultimately degrades into its lowest form—heat. It is this that, along with the heat absorption and low reflectivity of many roads and building materials, accounts for why most large cities average 100 (F) warmer than the surrounding countryside. This simple fact is the ultimate brake on industrial production. If there were no economic barriers to the conversion of earth's available materials into machines, tools, and the en­ergy to run them sufficient to supply today's global population at the living stan­dard that was typical of the core in the early 1970s, the energy required for this massive transformation of matter would by itself generate enough heat to turn the atmosphere into an oven that would cook us all to death (Commoner 1977; Georgescu-Rogen 1971). A second, less often articulated, implication of the thermodynamics of pro­duction is the dispersion of mineral resources. Iron ore, for example, is initially concentrated in a mining site. After purification and further concentration in a steel mill, it becomes a component in commodities that are distributed globally. When those goods are discarded by their end users, they eventually rust, leaving behind a small area of iron oxide that returns to the soil. The net effect of this process is that resources initially found in abundant and concentrated pockets become dis­persed in a way that makes them impossible to easily reclaim in the future. The overall volume remains the same, but its geographical redistribution fundamentally changes its accessibility to future generations. Acid rain results from the burning of coal with a high sulfur content. That coal, being more abundant and cheaper than the alternatives, is the fuel of choice for power plants throughout the world (particularly China). When burned, the exhaust contains sulfur dioxide (SO2) which quickly combines with water in the atmosphere to create sulfuric acid (H2SO4). The rain downwind raises the acidity of soils and streams, killing trees, bacteria, and insects. Damage from acid rain been well documented in the northeast of the U.S. and Canada, the Smokey Mountains of the southeastern U.S., and the Black Forest of Germany. The production and use of plastics and electrical components has entailed the use of certain chemicals (e.g., PCBs) that are "loose cannons" in the ecosystem. They are collectively called "environmental estrogens" because they mimic natural estrogens and thereby may potentially interfere with the sexual evolution of a large number of different species (e.g., mature male alligators in Florida with immature testes unable to generate viable sperm, accelerated rates of sexual maturation of human female children [Painter 1997, 1]), Some have speculated that these chemicals may even be playing a role in the observed disappearance of frogs and amphibians (Blaustein and Wake 1995). More commonly known and now actually regulated are the effects of CFCs on the ozone layer. Used until recently as coolants in refrigerators and air condi­tioners, solvents for cleaning electrical components, and propellants for spray cans, CFCs were quite abundant in the 1960s and 1970s. After use, they eventually float up into the stratosphere, several miles up and well above the cloud layer. At that high level, ultraviolet (UV) light (very high-energy photons just beyond the blue-purple part of the visible range) from the sun floods in directly. Photons with these energies can easily strip electrons from atoms and break apart molecules, so they are extremely dangerous to life. Any human exposed naked to such light would quickly burn to death from the radiation. Under normal conditions, oxygen (02) hit by UV light splits in two (0,) and then recombines into 03—ozone. (The same thing happens when lightning strikes, giving air its distinctive "fresh" smell after a summer thunderstorm--a fact taken advantage of by car manufacturers who spray their products with ozone to give them that "new car" smell). Ozone has the capacity to absorb UV light and re-emit the absorbed energy in a more benign lower frequency form as it creates Ozone. CFCs interfere with this process by preferentially attracting the oxygen atoms split by UV, thus preventing their recombination into ozone. Hence the ozone hole first noticed above the Antarctic and now also perceptible as patches of depletion in the Northern Hemisphere. The removal of the protection of ozone has allowed a dramatic increase of UV light proceeding unimpeded to the ground, especially in the portions of the Southern Hemisphere nearest the pole: South Australia, Chile, Argentina, and New Zealand. The effects have been observed in a myriad of forms, as an upsurge in skin cancer, cataracts, and blindness of sheep in New Zealand and kangaroos in South Australia. As with estrogens, some have speculated that excessive UV may be playing an additional role in the disappearance of the amphibians by sterilizing their eggs. Cases of melanoma have been proliferating in the U.S. and Canada as well, and followers of newspaper weather sections have doubtless noticed that most now feature a UV index as a routine part of their forecast. During the summer of 1995, the staff of the Baltimore Aquarium rescued a blind sea turtle from the coast of Delaware and were puzzled by the fact that he had cataracts while yet a juvenile of only 15 years. A less well-known outcome of increased UV radiation at ground level is a probable increase in mutations, especially among viruses, whose only protection from the air is a thin jacket of protein. The long-term results of such mutations are unpredictable. The UN-sponsored international agreement on regulation and eventual elimi­nation of CFCs (The Montreal Protocols reached in 1987) is one of the few true success stories of cooperation on a global level to address a global problem. Even so, it may take up to 50 years for the ozone layer to fully recover. Global warming from the introduction of greenhouse gases is another result of current technology found within both production and consumption. CFCs and methane (the latter largely from cattle and anaerobic bacteria) are each potent greenhouse gases, CFCs all the more so because they are very stable and very effective at blocking infrared (heat) radiation heading back out into space. However, the most abundant green­house gas is carbon dioxide (CO2), a direct product of fossil fuels. All automo­biles, planes, and ships burning hydrocarbons emit CO2 along with all coal or oil­ fired electric generators. Hence almost all of the machinery used in production and transport contributes to CO2 emissions. An extreme outcome of heat entrapment from CO2 and other greenhouse gases can be found on our nearest planetary neighbor Venus, whose proximity to the sun and heavily carbonized (CO2 and Methane) atmosphere sustains a surface temperature above the melting point of lead (over 700° F). Here on Earth, if it were not for naturally occurring levels of atmospheric C02, the surface temperature would be below freez­ing (0°C), liquid water would not exist, and life would be impossible. But it is a delicate balance. Too much warming and life (as we know it now) would die. It has already been observed that glacial ice packs arc retreating while plants and butterflies have been documented moving higher up mountains and further north (Peters and Lovejoy 1990). Melting ice suggests rising sea levels, which satellite data now confirm. The retreat of the last ice sheets, which at their maxi­mum 25,000 years ago stretched out across most of Europe, Russia, and North America in the North and equivalently in the South, raised sea levels over 300 feet. The remaining ice, if fully melted, would add another 250 feet. While we are yet far from that point, a rise of only one or two feet would permanently flood the current arable land around the Nile and has been estimated to be able to cut agri­cultural production globally by as much as 20 percent. Further, rising sea levels pose the potential for flooding important ports and coastal cities, as well as Pacific island states. Warming implies a general movement toward the poles of the temperate climate, a range of temperatures appropriate for our major food crops (wheat, rice, and maize). Unfortunately, at least in North America, the soils north of the (now global) "breadbasket" of the Great Plains are less fertile, implying a loss in yield with migration north. (Further, movement toward the poles implies increasing exposure to UV radiation.) For plants not under human cultivation, the polar shift in climate may outrun their ability to migrate, leading to their extinction (along with whatever other life forms depend upon them). The areas left behind are predicted to become prone to desertification. Indeed, portions of the U.S. state of Nebraska have rolling green hills that are actually sand dunes covered with grass. During the dust bowl era of the 1930s, the grasses died and the dunes moved with the wind as they reverted to desert. Current satellite data indicate that the same process has begun again. Pressures toward desertification are likely to grow, expanding deserts everywhere. The fundamental force powering all wind is heat, specifically the difference in heat between the equator and the poles. Hot, humid air rises high above the tropics and is blown toward the nearest pole. Along the way it cools, releasing its heat as rain. Storms are thus simply heat engines engaged in the impossible task of equalizing the temperature difference between the equator and the poles. The rotation of the Earth sets some of these storms to spinning like pinwheels, generating counter-clockwise hurricanes (as they are called in the north Atlantic) and clockwise cyclones (their Asian equivalents below the equator). Sophisticated climate models run on supercomputers predict more frequent storms having higher wind-speeds with increased warming, implying cor­responding increases in deaths and infrastructural damage. In reality, the two hurricane seasons (1995-6) in the Atlantic have been the most active of any on record in the past 20 years, and the 2017 season appears to be much more violent than then. Because the global population is growing, and most of that population lives near rivers and seacoasts, the mortality figures could become truly staggering as well as the cost of repair (already a demand on the budget of the United States and well outside the means of governments in the periphery). Adding to the difficulties of prediction here is that overall warming is still consistent with local cooling in certain areas for brief periods, leading to wild oscillations in annual temperatures and precipitation (Karl, Nichols, and Gregory 1997). More recent models have even suggested that the temperature difference between the poles and equator may ultimately decrease, shutting down the “Gulf Stream”/”Atlantic Conveyor,” implying a reduction in storm severity (Karl, Nichols, and Gregory 1997). Clearly atmospheric science has a need for much greater refinement ahead before it can reliably guide our expectations. But setting aside these nightmare scenarios, even the changes observed so far have serious implications for the viability of mechanized agriculture and au­tomated industry, each powered by the fossil fuels shown already to be so de­structive to the biosphere. Automation in the contemporary core is pervasive. Almost every act of con­sumption involves a machine at some stage, from cash registers to automated tellers, while small computers are included in an ever-broader array of end-use commodities such as radios, ovens, and refrigerators. These examples are but echoes of the real revolution experienced in production that began in the 1970s. The hallmark of the relations of production characterizing capitalism is the structured antagonism between capital and labor. Precisely because capital needs labor to create commodities, it must solicit labor's cooperation and even support. Yet, of course, market competition continually encourages capital to reduce labor costs even while raising worker output. Labor, in its turn, has typically fought against these pressures from capital by slowdowns, strikes, and so forth. Until recently, the weapons available to capital to maintain its control were limited: the direct supervision of assembly, the importation of strikebreakers, and the employment of state-sponsored violence. Now, at last, during this century scientific investigation has yielded technologies that have enormously enhanced the power of capital against labor. These are, first, an infrastructure of telecommunication that allows for the remote control of multiple production sites and, second, the development of semi-intelligent machines that can potentially fulfill capital's ultimate dream of remov­ing labor altogether. But an important cost of each of these developments has been an increase in the consumption of fossil fuels. The motivation for the very first factories (in the eighteenth century) was not to increase the output per worker directly, but to do so indirectly by gathering all of the laborers together under the same supervised roof (Marglin, 1974). Before then, raw wool was spun into yarn in the homes of young women earning their dowries (Tilly and Scott, 1978). Their aggregation into factories forced them to work harder, deprived them of house-hold labor, and family social relations. That exten­sion of the control of capital over labor expanded considerably in the late nineteenth and early twentieth centuries. In the steel industry, for example, one of the many methods created to divide laborers under the guise of "efficiency" was the imposition by management of artificial distinctions between workers of equal skill in the form of differing job titles and wages assigned to separate locations in the same assembly line (Stone, 1974). The early decades of the twentieth century also saw Taylor's time-motion studies, which complemented and informed the perfec­tion of the assembly line (Braverman, 1974). Each of these successive reorganiza­tions of production were justified in their day as technical improvements in effi­ciency, although the actual changes in output per worker were probably less dra­matic than the extension of the political and social control of capital over labor. In contrast with these earlier reorganizations of the shop floor, the succes­sive and cumulative inventions of the vacuum tube (1920s) computer (1940s) and semiconductor (1950s) truly revolutionized production in a technical way. By endowing machines with the capacity to make "choices" (however crude), in­formation technology has at last allowed machines to become genuine robot-work­ers, thereby enabling them to seize the bottom rung of the job ladder. In the United States, this has been the rung traditionally held by the unskilled or new immigrant (Aronowitz, 1973), whose expulsion from the formal "monopoly sector" workforce of the core by the proliferation of robot technology has trapped them for the indefi­nite future in the “informal”/”competitive” sector. We can only expect that future technical change will eventually enable robots to climb ever-higher up the rungs of the job ladder, thereby expelling ever more "skilled" workers into the informal sector as their decision-making powers improve. The necessary result will be a two-layered economy, one “formal,” bureaucratic, and cooperative with (and governing) the state; the other “informal,” gang-controlled, illegal, and based on barter, smuggling, and personal ties. The revolutionary effects of the microchip started emerging in the form of robots on the shop floor in the 1970s and early 1980s, and were felt first by the working class, whose discontent made headlines as shootings on the shop floor (Georgakis and Surkin, 1975). But by the mid-1980s the new technology had crept up to the levels of middle management, even as it spilled out of the most monopolized parts of the private sector into the offices of government (e.g.--“Going Postal”). Specifically, the personal computer quickly transcended its initial role as a smart typewriter to encompass scheduling, accounting, statistics, scientific computation, blueprints for product design, movie animation and special effects, and so on. These multiple uses allowed for the combi­nation of many different jobs onto one desktop, which in turn allowed for the elimi­nation of an equivalent number of now redundant personnel and positions. Insofar as these high-wage blue-collar and mid-range white-collar workers had been the core tax base of the welfare state, the dramatic contraction of their numbers during the microchip revolution (as manifested both by automation and relocation abroad of production facilities) eviscerated that base, accelerating the growing fiscal crisis of the United States government at all levels as predicted and elaborated by James O'Connor as early as 1973 (O'Connor, 1973). At that time he argued that the diminution of employment in the monopoly ("formal") sector was already threatening the supply of tax revenue, and history since has clearly vindicated his expectations: higher taxes on the shrinking number of high--wage work­ers in the (private) monopoly and state sectors, combined with a contraction of employment in those same sectors, and diminishing services available from the state have all coa­lesced to create an angry attitude toward the state, particularly within the ranks of the white males previously granted privileged entree into the monopoly and state sectors. By the late 1970s in the United States the implicit social contract (of a balance between wages, profits, and state services) among capital, labor unions, and the state that had reigned since World War II began to unravel. Starting in California with the tax revolt organized by Howard Jarvis in a popular referendum in 1978 and ratified nationally by the election of Ronald Reagan in 1980, the hos­tility of the downsized working classes and small business owners toward govern­ment and taxes has been skillfully manipulated by the right (by discrediting taxation) to cultivate antigov­ernment feelings strong enough to enthusiastically support the dismantling of the postwar welfare state. Just as the United States led the technical transformation of agriculture among the countries of the core, so too it has also led in the contraction of the welfare state among those same countries. Within the limits imposed by their respective histo­ries of class struggle, Britain, Germany, the Netherlands, and even France have been compelled to follow the U.S. example during the 1980s and 1990s by also constricting welfare outlays and tightening tax codes. In every case, these policies were aimed at cop­ing with the same global problem: the evacuation of employment aris­ing from automation and outsourcing within each of the local monopoly sectors. The global reorganization of production enabled by telecommunications and the microprocessor offered possibilities of higher profits from automation and factory relocation to the semiperiphery that were eagerly sought by monopoly firms in all of the nations of the core. From an historically more detached perspective, the popularity of the revolt against the postwar welfare state can be understood as having been the political manifestation throughout the core of long-term changes in technology and labor mar­ket structure apparent since at least the oil crisis of 1973 (Mandel 1978; Kotz, McDonough, and Reich 1994; McMichael 1996). Put another way, the social structure of accu­mulation (prevailing since Bretton Woods); the social contract between capital and labor within the core and the financial institutions regulating relations between the core and periphery—fell apart during the 1970s. Real wages throughout the core have stayed at roughly the same level since the middle of that decade, unemploy­ment has swelled until workers have been compelled to take jobs offering one-third of their former wages, and the resultant loss of tax revenue created a fiscal crisis which stalled out the welfare state during the late 1970s. On the international level of global trade, in response to shrinking core markets, the debt crisis of the semiperiphery (whose export earn­ings depend entirely on core markets) became so bad that it compelled a serious reexamination of the viability of the World Bank Group in the early 1980s (McMichael 1996; Suter 1986). There were transient exceptions: the "Asian Ti­gers" of the semiperiphery were the beneficiaries of monopoly sector investment (the destinations for the flight of manufacturing and investment leaving the core). However, the rest of the semiperiphery and all of the periphery were less fortunate. Most of the former were saddled by debt, among whom some (e.g. Mexico and Brazil) precipitated the debt crisis of the early 1980s. Among the latter, Latin America and much of Asia struggled hard just to stay in place, while in Africa the economic situation actually deteriorated by every measure (see Terlouw, 1992). The collapse of the USSR and its Eastern European satellites can also be understood within this broader context of global disarray as a reflection of their gradual digestion by the capitalist world-economy (Chase-Dunn 1982). Since World War II, a growing dependence on sales to the capitalist world for state revenue had eventually integrated the "socialist camp" into a role equivalent to the capitalist semiperiphery. For example, since the late 1970s Poland and Hungary had entered fully into the membership of the World Bank (Payer 1982). The collapse of 1989 can be under­stood as yet one more expression of the global depression and dis/reorganization afflicting the semiperiphery of the world-economy from 1973 to 1996 (the year of the official end of the "Uruguay Round" of the GATT and its conversion into the WTO). What the planet's peoples have experienced over the last 20 years is the largest restructuring of the mechanisms of accumulation to have occurred since the Great Depression of the 1930’s, or the European conquest of the globe. The global mobility of capital combined with its command of armies of robots, both enabled by the microchip revolution, has finally broken the barriers to the equalization of wages between core and periph­ery by pitting their workforces directly against each other. Because the previous regime of unequal wages had sustained the high wages of the core and—via their taxes—the welfare state, the elimination of that core-periphery wage inequality has both threatened to eliminate that state and at the same time cast the lot of the workers of the core into the same pit as that of their brethren in the periphery. The long-term political results are as yet unpredictable, but are likely to be volatile. In many parts of the world, classes overlap with ethnic categories—occupations (hence incomes) have become historically and regionally associated with peoples sharing similar cultures and backgrounds. The United States abounds with examples: Mexican immigrants provide the bulk of labor for large corporate farms; Blacks and exiles from Central America provide the lowest wage unskilled work in hotels and restaurants along the east coast and in factories in the Midwest (Georgakas and Surkin 1975); motel chains have become increasingly owned by people from the Indian subcontinent; and many small shops in the ghettos of both coasts are now owned by Koreans (Bonacich, 1994). On a global scale and in historical perspective, social scientists have docu­mented how certain ethnic groups who had already adapted to the role of small-scale retailers were deliberately encouraged and sometimes even relocated by co­lonial powers to be ethnic buffers between the general population and the rulers at the top (Bonacich 1994; Portes and Walton 1981; Wallerstein 1979). Specific ex­amples of such “middleman minorities” are the Jews in Europe, the Indians in Africa and the Caribbean, the Chinese in Southeast Asia. and Korean shopkeepers in the U.S. today. Individuals from these national/ethnic backgrounds had already evolved into the niche of small-scale lenders and shopkeepers before European coloniza­tion. But their respective aptitudes were encouraged and facilitated by the colonial powers in the nineteenth century. With the help of these powers, Indians were settled in Africa and the northern coast of Latin America, Chinese were acceler­ated in their colonization of Malaysia and Indonesia, and the refugees from Jewish pogroms in Europe fled to New York. Other racial and ethnic gradations have evolved quite independently of such outside "help." Latin and Central Americans assign low status to anyone defined as descended from the indigenous (pre-conquest) population, Europeans discrimi­nate against southern Europeans in general and Roma in particular, Russians loathe equally Jews and people from the south (e.g., Georgians, Kazaks); and Indi­ans assume that those with darker skin are from the caste of untouchables. This global overlap between class and race (always socially defined) ex­acerbates the political dangers of our era. In a time of generalized contraction of state expenditures, the falling living standards of those dependent upon those ex­penditures pits competing constituencies against each other. Insofar as these com­peting groups are often associated with different ethnicities, the political tempta­tion among the elite to convert this competition into ethnic hatred is great—a perfect distraction from the underlying causes of globalized automation. Within the countries of the core, the flight of capital, the defeat of labor, and the resultant fiscal crisis has fueled the rise of neo-fascism among the working class youth of France, Germany, England, and the United States. Their ideological response to the elimination of a safety net is to attack "foreigners" with darker skins. Among the countries of Af­rica, the withdrawal of patronage income from the cold war has sometimes led to the collapse of the state altogether as ethnic peace could no longer be purchased with outside income (e.g., Ethiopia, Somalia, Rwanda, Burundi, Zaire, Congo, Liberia, and Sierra Leone). Such state collapses have driven peasants out of their homes into horrible refugee camps patrolled by predatory UN forces. Additionally, adding to these war refugees, global warming throughout the marginal land of the periphery has driven traditional labor to migrate north to Europe and the United States and Canada, accelerated in their evacuation by Chinese investment in agricultural automation and infrastructure using Chinese labor in both Latin America and Africa. The collective power of these environmental and geo-political forces have coalesced into an explosion of over-crowded sewage depots rife with human misery and disease. These camps are the sources of the desperate young men willing to die while crossing the Sahara to head north, only to be once again imprisoned and beaten should they make it to Europe (or the United states). The temporal coincidence of their arrival with the destruction of white labor in the north make ethnic warfare inevitable, and its exploitation by fascist politicians just as unavoidable. Other states face the same challenges, but may yet avoid similar disasters. Yugoslavia has demonstrated that even the semiperiphery is not immune as is Brazil and Mexico in 2017. But even where total anarchic collapse has been avoided, major restructuring has been required as states scramble to catch up with the new mobility of capital (e.g., the bailout of Mexico following NAFTA and a similar IMF-sponsored rescue package for Thailand). The entire international hierarchy of core, semiperiphery, and periphery prevailing since the earliest days of colonialism is being restructured by the new mobility of capital enabled by the microchip, leading to a conversion of the stratification between nations into a stratification within them. Accordingly, we are living in a time when the traditional hostility between separate nations is being replaced by a class/ethnic hostility within them. Global war is being augmented/replaced by civil wars that are ethnically based. All of this restructuring is made possible by the microchip, which is in turn dependent upon an industrial base fueled by fossil fuels, which in their turn power global warming, which in its turn must ultimately contract global food supply and drive food prices up. Unless the benefits of the monopoly profits from automation are redistributed from the capitalist class into the rest of the working class as higher wages to support higher food costs, the necessary result must be sharper conflicts and greater killing. Ultimately, we may need to devise a system of redistribution that segregates employment from income altogether. One last factor left hitherto untouched is the prospect of global war. This topic is sufficiently complex that it has generated a substantial literature (e.g.. Chase-Dunn and Bornschier 1998; Goldstein 1988; Thompson 1990; Modelski and Thompson 1988; 1998). The central question motivating many of these works is whether global war is cyclical and, if so, what the mechanisms governing its frequency are. The answer adopted by many of these authors is that it is indeed cyclical, that the governing cycle has a period of between 40 and 60 years, and that the recurrent issue is the need to update the interstate hierarchy implicit within the existing international political structures to reflect the economic changes in that hierarchy experienced since the preceding inter-core ("world") war. Put simply, world wars are the means by which obsolete global political institutions are smashed and reorganized to make them reflect the new economic power hierarchy. Should the ordinary war cycle continue, the likelihood for the next war should be greatest around 2010 to 2020. If, however, one factors in the current apparent collapse of the states in the periphery, the growth of inequality in the core leading to worsening ethnic tension and state de-legitimization as disparities within the core reflect ever more faithfully the disparities outside of it, and, finally, the uncertainties of harsher weather and rising food prices addressed here, then the resultant threats to global security (however defined and by whom) may greatly accelerate the timing of the war cycle. Finally, should such a war break out it will almost certainly be nuclear (if only in part), in which case every single bio-spherical problem cited above will be grossly worsened and the probability of total social collapse made far more likely. The title of this essay is a deliberately mixed metaphor. The "Killing Fields" refers to the genocide perpetrated on the people of Cambodia by the administration of Pol Pot, while The "Horsemen" refer to the legendary four forces of the "Apocalypse” found in the book of Revelations in the Christian Bible: starvation, disease, pestilence (insects), and War. The former was, in retrospect, an early example of the genocidal collapse of a peripheral state, the latter a plausible prediction about our collective future based on biospheric and world-system processes. My choice of this title was to suggest the linkage between the capitalist imperative to use fossil fuel tech­nology against labor and the destruction of the biosphere; how that ecological destruction will necessarily entrain starvation, disease, and war; and, finally, how the stresses created by this social dissolution will enhance the likelihood of wars of "ethnic cleansing." The parallel between the biblical prophecy and our current challenges is striking. Unchecked global capitalism has put us in a double-bind: if the supply of fossil fuels were unlimited, global warming would eventually eliminate arable land and cook us to death. Alternatively, assuming the supply of fossil fuels is limited, their exhaustion will drive up prices for food, housing, and transport to levels beyond the reach of most people, fueling class and ethnic conflict. Either scenario is fatal. But the second is more likely. Although stocks of fossil fuels unknown today may yet be discovered, the energy required to locate and retrieve them must eventually grow exponentially." This fact will inevitably manifest itself as increas­ing energy prices. Obviously alternative energy sources will become more fre­quent and perhaps even dominant. However neither solar, geothermal, nor nuclear energy can be convened into fertilizers, herbicides, and pesticides. These attributes are unique to fossil fuels. As they diminish, agricultural yield per acre must fall and food prices rise proportionally. This is particularly true of the soils in the trop­ics, which have by now become almost completely dependent on imported chem­icals based on fossil fuels (McMichael 1996; Colinvaux 1978). When one includes in this picture the probability that robots could displace all but the most highly trained "knowledge workers," the scenario becomes bleak: a huge mass of malnourished and desperate people struggling to live from a shrink­ing black market trafficking in illegal goods, packed tightly together in dilapidated ghettos rife with virulent diseases and gang violence, and sporadically involved in ethnic/neighborhood/gang wars. Even in the absence of another inter-core and nuclear war, the extremely high death rates that would accompany this grim sce­nario would, over several generations, reduce the global human population back down to levels supportable by low-energy agriculture—perhaps the two to three billion we numbered globally before World War II. Of course nuclear war would itself dramatically reduce population levels as well as infrastructural support. But even today, we must remember that the destruction of the tropics is creating a mass extinction already worse than that accompanying the loss of the dinosaurs (Wilson 1990, 1992). For example, today there remain no more than 3,000 tigers alive on the entire planet (National Public Radio, All Things Considered, July 9, 1997). The numbers of black rhinoceros are similar and lions not far behind. But for every charismatic large animal endangered, there are millions of species of smaller in­sects, plants, and amphibians disappearing with every acre of deforestation, not just in the tropics but as well across the countries of the core. To the extent that these issues have been publicly addressed at all, the problem hits been laid at the doorstep of population growth particularly in the periphery, But it should by now be clear that such a belief is at best misinformed: both the growth in population and the threats to life on the planet in general are caused by the use of technology solely for the pursuit of capital accumulation on a world scale. The human historical record reveals many examples of the rise of societies whose complex organization allowed for the production and distribution of enough food that all could live. But the same record also shows that every one of these societies crumbled, often because of resource depletion accompanied by civil and/ or border wars (Tainter 1988). The argument that I have presented here merely shows that we continue to be constrained, as were our ancestors, by the boundaries imposed by the physical laws of energy flow (thermodynamics). Unlike them, we have the intellectual tools to predict and even avoid our fate. But these tools and knowledge are ignored and unheard when they imply social changes that are contrary to the needs of those in power. The power for change lies with the general population worldwide. If they remain uninformed, their spontaneous revolts will simply accelerate the descent into anarchy. But if properly informed, the popular mobilization required to re­organize the social order—already implicit within the de-legitimation of the cur­rent states—can be focused into a coherent global objective. The occurrence of several major natural disasters may yet be necessary to provide the correct uni­fying vision. Tragic as this may be, to paraphrase Samuel Johnson, "There is noth­ing like a hanging to concentrate the mind." 1. At its most simplistic level, this collision appears to be merely a restatement of Malthus: the human population is growing faster than our ability to increase food yield per acre. How­ever there is an important modification to this apparent acceptance of Malthus that must also be included. Malthus and his followers have tended to blame poverty on "over--population." thereby shifting the blame for income inequality away from capitalist accumulation to the victims of that accumulation. In stark contrast to this temptation to "blame the victim," the analysis here will demonstrate that the primary culprits of our collective predicament are to be found in the mechanisms that sustain the rich, not in those that perpetuate the poor. 3. The red soils of the southern United States seem at first an exception to this generalization, because they are fertile when cared for. However, it may be that the lower incidence of solar energy there as compared to the tropics has prevented the development of a biomass as aggressively efficient in extracting food as that found in the tropics. 4. Exactly consistent with the Gaussian ''exclusion" principle explained by Bonner (1988). The two most obvious exceptions are the Mayan and Khmer (Anghor Wat) civilizations, each relatively recent entries to the historical stage. However each was located on floodplains, whose local fertility is greatly enhanced by the importation of runoff from all of the catchment areas upstream. 7. The label "tributary" was originally applied by Amin (1976) to characterize the principal form of surplus accumulation used by the pre-capitalist empires. It refers to the institutional forms that accumulation took: on an individual level, the peasant or slave that worked the land was expected to give up a portion of his crop to the representatives of the state as a "tribute" or tax; while surrounding client or colonial states purchased their contin­ued nominal "independence" also by the payment of "tribute." On both levels, the revenue of the state was a form of what would now be called a "protection racket." For further information see Amin (1976) or Chase-Dunn and Grimes (1995). 8. Even though it did greatly catalyze the conversion of large areas of land from traditional uses to sheep production while simultaneously encouraging the foundation of plantations using slave labor for cash-crop production. 9, An excellent account of the development of these higher incomes in the colonies of European settlement can be found in Amin (1976). 10. The regimentation of worker movements in commodity assembly based upon the time-motion studies of Frederick Taylor, extensive discussion of which can be found in Braverman (1974). 11. Fossil fuels are solar in origin as well, but insofar as their initial solar "charge" happened during and before the dinosaur eras, our use of them now is like taking money out of a savings account without any restoration. We are living of our solar "capital." 12. A longer and more specific list can be found in Commoner (1971). 13. Dengue fever has already been observed moving north from Central America into Mexico. 14. Ironically counter to this trend, the withdrawal of cold war patronage has actually facili­tated peace agreements and democratization in El Salvador and Guatemala because the support of the United States was essential to the power of the military supporting the oligarchies there. 15. This is another manifestation of the second law of thermodynamics elaborately and persuasively explained by Commoner (1977). Amin, Samir. 1976. Unequal Development. New York: Monthly Review Press. Aronowitz. Stanley. 1973. False Promises: The Shaping of American Working Class Con­sciousness. New York: McGraw-Hill. BBC. 1997. "Outlook." May 14. Blaustein, Andrew R., and David B. Wake. 1995. The Puzzle of Declining Amphibian Popu­lations. Scientific American 27(4): 52-57. Bonacich, Edna. 1994. The New Asian Immigration in Los Angeles and Global Restructur­ing. Philadelphia: Temple University Press. Bonner, John Tyler. 1988. The Evolution of Complexity by Means of Natural Selection. Princeton: Princeton University Press. Braverman, Harry. 1974. Labor and Monopoly Capital: The Degradation of Work in the Twentieth Century. New York: Monthly Review Press. Burbach, Roger. and Patricia Flynn. 1980. Agribusiness in the Americas. New York: Monthly Review Press and the North American Congress on Latin America. Chase-Dunn, Christopher, and Peter Grimes. 1995. World-System Analysis. Annual Review of Sociology 21: 387.417. Caldwell, Lynton Keith. 1996. International Environmental Policy, 3rd ed. Durham, NC: Duke University Press. Chase-Dunn, Christopher, and Tom Hall. 1997. Rise and Demise: Comparing World-Sys­tems. Boulder. CO: Westview Press. Chase-Dunn, Christopher, and Volker Bornschier, eds. 1998. The Future of Global Conflict. London: Sage. Chase-Dunn, Christopher. 1982. Socialist States in the World- System. Beverly Hills, CA: Sage. Chew, Sing. 1996. "Accumulation, Environmental Degradation, and Core-Periphery Rela­tions in the World-System, 2500 BC to 1990 AD." Paper presented at the 36th annual meetings of the International Studies Association, Chicago, Illinois, February 21-25. Colinvaux, Paul. 1978. Why Big Fierce Animals Are Rare. Princeton, NJ: Princeton University Press. Commoner, Barry. 1971. The Closing Circle: Nature, Man, and Technology. New York: Bantam. Commoner, Barry. 1977. The Poverty of Power: Energy and the Economic Crisis, New York: Bantam. Folbre, Nancy. 1977. Population Growth and Capitalist Development in Zongolica. Veracruz Latin American Perspectives 4(4): 41-55. Georgakas, Dan, and Marvin Surkin. 1975. Detroit: I Do Mind Dying. A Study in Urban Revolution. New York: St. Martin's Press. Georgescu-Rogen. Nicholas. 1971. The Entropy Law and the Economic Process. Cambridge, Harvard University Press. Gibbons, John H., Peter D. Blair, and Holly Gwin. 1990. Strategies for Energy Use. In Managing Planet Earth: Readings from Scientific American Magazine, 85-96. San Fran­cisco: Freeman. Goldstein, Joshua. 1988. Long Cycles: Prosperity and War in the Modern Age. New Haven. CT: Yale University Press. Grimes, Peter. 1982. Poverty, Exploitation, and Population Growth: Marxist and Mullins sian Views on the Political Economy of Childbearing in the Third World. Master's Thesis, Michigan State University. IPCC (Intergovernmental Panel on Climate Change). 1990. Climate Change: The IPCC' Scientific Assessment, ed. J, T. Houghton, G. J. Jenkins, and J.1. Ephraums, New York Cambridge University Press. IPCC (Intergovernmental Panel on Climate Change). 1992. Climate Change 1Q02, The Supplementary Report to the IPCC Scientific Assessment, ed. J. T. Houghton. B. A Callander, and S. K. Varney. New York: Cambridge University Press. Karl. Thomas R., Neville Nichols, and Jonathan Gregory, 1997. The Coming Climate. Sci­entific American (May): 79-83. Kota, David M., Terrence McDonough, and Michael Reich. 1994. Social Structures of Ac­cumulation. New York: Cambridge University Press. la Riviere. Maurits. 1990. Threats to the World's Water. In Managing Planet Earth: Readings from Scientific American Magazine, 37-49. San Francisco: Freeman. Maddison, Angus. 1995. Monitoring the World-Economy 1820-1992. Paris: Organization for Cooperation and Development in Europe, Development Centre Studies. Mamdani, Mahmood. 1972. The Myth of Population Control: Family, Caste, and Class in an Indian tillage. New York: Monthly Review Press. Mandel. Ernest. 1978. The Second Slump, London: New Left Books. McMichael, Philip, 1996. Development and Social Change: A Global Perspective. Thou­sand Oaks, CA: Pine Forge Press. Mitchell, Brian R. 1993. International Historical Statistics: The Americas 1750-1988, 2nd ed. New York: Stockton Press. Modelski, George. and William R. Thompson. 1988. Seapower in Global Politics, 1494- /993. Seattle: University of Washington Press. Modelski, George, and William R. Thompson. 1998. Innovation, Growth and War: The Co-Evolution of Global Politics and Economics. Columbia, SC: University of South Caro­lina Press. National Public Radio. 1997. All Things Considered. Broadcasts on May 9. June 5, July 9. O'Connor, James. 1973. The Fiscal Crisis of the State. New York: St. Martin's Press. Painter, Kim, 1997. Puberty Signs Evident in 7- and 8-Year-Old Girls. USA TODAY, April 8. 1. Payer, Cheryl. 1982, The World Bank: A Critical Analysis. New York: Monthly Review Press. Perlman, Michael, 1977. Farming for Profit in a Hungry World: Capital and the Crisis in Agriculture. New York: Universe Books. Peters, Robert L., and Thomas E. Lovejoy. 1990. Global Warming and Biological Diversity. New Haven, CT: Yale University Press. Pimentel, David, and C. Harvey. 1995. Environmental and Economic Casts of Soil Erosion and Conservation Benefits. Science 267(Feb. 24): 1117-23. Portes, Alejandro, and John Walton. 1981. Labor, Class. and the International System. New York: Academic Press. Rudd, Tom, and Chun Fu. 1996. A requiem for the Southern Regionalists: Reforestation in the South and the Uses of Regional Social Science. Social Science Quarterly 77 (Dec.): 804-20. Runnels, Curtis N. 1995. Environmental Degradation in Ancient Greece. Scientific American 272(3): 96-99. Sanderson, Steven K. 1995. Social Transformations: A General Theory of Historical De­velopment. London: Basil Blackwell. Stevens, William K. 1997. Five Years After Environmental Summit in Rio, Little Progress. New York Times, June 17, C-8. Stone, Katherine. 1974, The Origins of Job Structures in the Steel Industry. The Review of Radical Political Economics 6(2): 61-97. Suter. Christian. 1986. Debt Cycles in the World-Economy. Boulder, CO: Westview. Terlouw, Cornelius Peter. 1992. The Regional Geography of the World-System: External Arena, Periphery, Semiperiphery, Core. Utrecht: Faculteit Ruimtelijke Wetenschappen, Rejksuniversiteit Utrecht. Thompson, William R. 1990. Long Waves, Technological Innovation and Relative Decline. International Organization 44: 201-33. U.S. Bureau of the Census. Washington, DC: United States Government Printing Office. Wallerstein, Immanuel. 1979. The Capitalist World-Economy. New York: Cambridge Uni­versity Press. Wilson, Edward 0. 1990. Threats to Biodiversity. In Managing Plana Earth: Readings from Scientific American Magazine, 49-60, San Francisco: Freeman. World Bank. 1982. World Tables. Washington, DC: World Bank Group. At its most simplistic level, this collision appears to be merely a restatement of Malthus: the human population is growing faster than our ability to increase food yield per acre. How­ever there is an important modification to this apparent acceptance of Malthus that must also be included. Malthus and his followers have tended to blame poverty on "over--population." thereby shifting the blame for income inequality away from capitalist accumulation to the victims of that accumulation. In stark contrast to this temptation to "blame the victim," the analysis here will demonstrate that the primary culprits of our collective predicament are to be found in the mechanisms that sustain the rich, not in those that perpetuate the poor. The red soils of the southern United States seem at first an exception to this generalization, because they are fertile when cared for. However, it may be that the lower incidence of solar energy there as compared to the tropics has prevented the development of a biomass as aggressively efficient in extracting food as that found in the tropics. Exactly consistent with the Gaussian ''exclusion" principle explained by Bonner (1988). The two most obvious exceptions are the Mayan and Kmer (Angry Wat) civilizations, each relatively recent entries to the historical stage. However each was located on floodplains, whose local fertility is greatly enhanced by the importation of runoff from all of the catchment areas upstream. The label "tributary" was originally applied by Amin (1976) to characterize the principal form of surplus accumulation used by the pre-capitalist empires. It refers to the institutional forms that accumulation took: on an individual level, the peasant or slave that worked the land was expected to give up a portion of his crop to the representatives of the state as a "tribute" or tax; while surrounding client or colonial states purchased their contin­ued nominal "independence" also by the payment of "tribute." On both levels, the revenue of the state was a form of what would now be called a "protection racket." For further information see Amin (1976) or Chase-Dunn and Grimes (1995). Even though it did greatly catalyze the conversion of large areas of land from traditional uses to sheep production while simultaneously encouraging the foundation of plantations using slave labor for cash-crop production. An excellent account of the development of these higher incomes in the colonies of European settlement can be found in Amin (1976). The regimentation of worker movements in commodity assembly based upon the time-motion studies of Frederick Taylor, extensive discussion of which can be found in Braverman (1974). Fossil fuels are solar in origin as well, but insofar as their initial solar "charge" happened during and before the dinosaur eras, our use of them now is like taking money out of a savings account without any restoration. We are living of our solar "capital." A longer and more specific list can be found in Commoner (1971). Dengue fever has already been observed moving north from Central America into Mexico. Ironically counter to this trend, the withdrawal of cold war patronage has actually facili­tated peace agreements and democratization in El Salvador and Guatemala because the support of the United States was essential to the power of the military supporting the oligarchies there.